Anthony Stevens -- Making Soup. 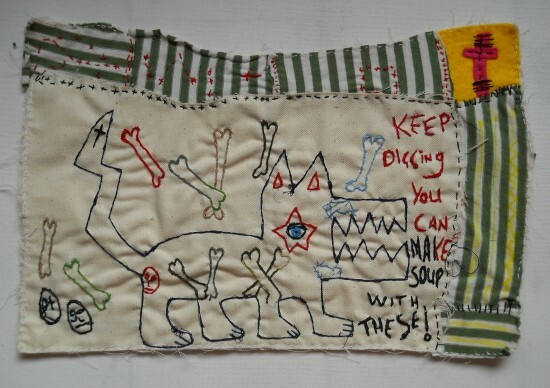 Prick Your finger is delighted to announce the opening of ‘Anthony Stevens: Making Soup’; from 13 June – 10 July 2014. 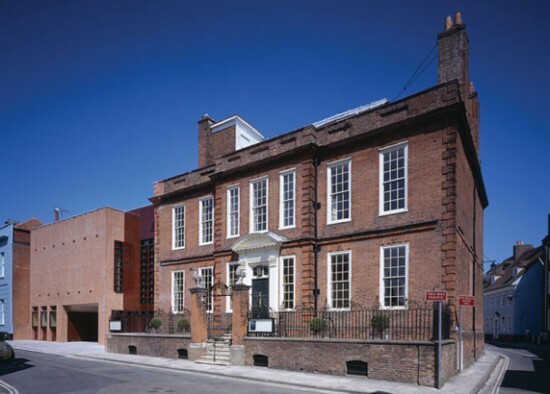 We were introduced to Anthony’s work through The Pallant House Gallery’s ‘Outside In’ program. Outside In, was founded for artists who find it difficult to access the art world. Prick Your finger is it’s own art world, and like Anthony’s work; inspired by the Punk Rock movement. Born in Birmingham in 1978, Anthony travelled around looking for work before settling in Brighton; where he now creates his Punk Rock- and Buddhist-inspired textiles and drawings. His first brush with art was at a young age, when he would make small printed bags with his mother, although it wasn’t until his early twenties that he really began to focus on it as a serious endeavour following employment at a day centre in a creative role. Stevens started producing his trademark stitch-work after a bout of disillusionment with the clothing market. Traipsing the Laines in Brighton, he decided to stitch his own t-shirts. During this short period, he began to take more notice of the process he was using; sifting, sorting and separating what was useful, but not throwing anything away. He would then cut out the pieces he did want to keep before reorganising them. Stevens wants to jolt the audience with his work; make them sit up and listen. There are deep symbolic meanings hidden beneath the surface that he encourages people to search for, like the recurring stripes alluding to the distinction between life and death. About Outside In Outside in is a national project established in 2006 to provide a platform for artists who are traditionally excluded from the art world due to health, disability, social circumstances, or because their work does not conform to what is usually considered as art. Its main vehicle is a triennial open art exhibition. The project won the Charity Award in the Arts, Culture and Heritage category in 2013. Showing work by Outside In artists is important to Prick Your Finger. All our customers make textiles because something deep inside them requires it. Whether our exhibitors have full time career with international success, or a one off show for one month, the stitches we show, with their accompanying stories, always exude cause and effect. Anthony we hope you have a nourishing time with your show. Kandy Diamond! How Did You Do It?